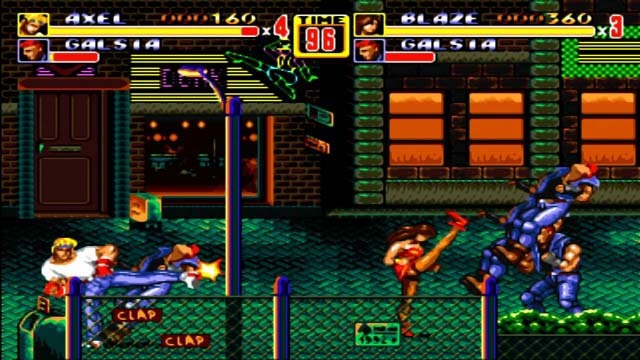 Streets of Rage 2 is an arcade style beat’em up. It closely resembles games like Final Fight and Double Dragon but Streets of Rage 2 did not start in arcades. It was a Sega exclusive title released for its’ Master System, Game Gear, Mega Drive and the Sega Genesis. It has been a year since Blaze, Adam and Axel defeated the leader of the syndicate Mr. X. Axel has moved on to become a bodyguard and Blaze has decided to teach dance. Adam however rejoined the police force and now lives with his little brother Eddie but they call him Skate. Coming home one night Skate finds his house in ruins and a note with a picture of his brother chained and at the feet of Mr. X. A new crime wave starts the next day and Blaze, Skate, Adam and Adams’ friend Max Thunder a professional wrestler decide to take on Mr. X once more. Streets of Rage 2 does some really great things. Combat is very smooth and we had no control issues at all. 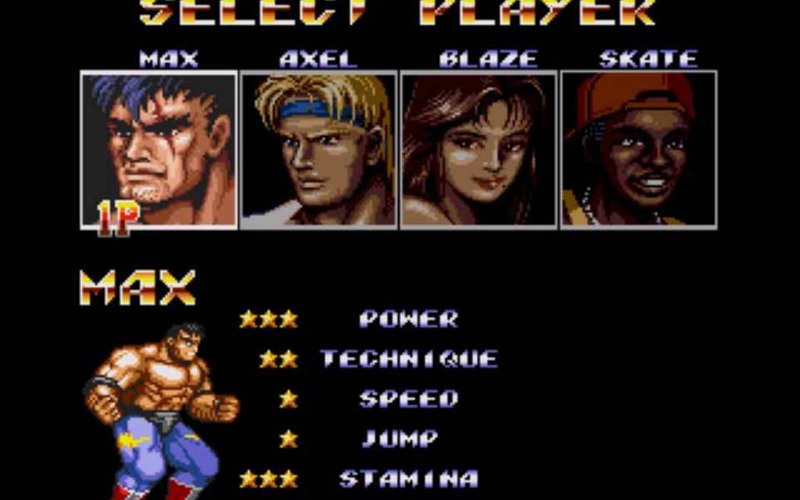 This time you have a choice of four different fighters with Axel and Blaze who return from the first game. They are nicely balanced when it comes to power and speed and Skate and Max are extremes in opposite directions. Skate is really fast and can jump really high while Max is very powerful but is so slow at all times. You can play in single player or in co-op. Each is fine but it is a little more fun to play with someone else. You can beat the game either way. There is a duel fight vs option, you can fight each other as if it was a Street Fighter game, very common now but ground breaking at the time. Streets of Rage 2 has 8 total stages and the game will take you 1 hour or so to get through each time. The game also has a high replay value. You want to try it on a more difficult setting and it has a lot of mid-level bosses. Each stage has several sections each having a boss so it does not feel repetitive. Streets of Rage 2 does only have one ending unlike the other games in the series. Streets of Rage 2 is the only game that is available by itself. You can download it from PlayStation Network, Xbox Arcade, Nintendo eshop and various other places for computers on mobile devices. It is an outstanding a game that still has a very high fun factor. It is worth paying $5.00 or under for but sales do happen and if you find it for under $3.00 it is a MUST BUY PRICE and Streets of Rage is a must play for any retro gamer.